Situated in the SOUGHT AFTER Planets development. This EXTENDED detached family home is offered in SUPERB condition throughout. With a DOWNSTAIRS cloakroom, lounge separate dining room, STUDY/FOURTH BEDROOM. Kitchen with built in appliances. THREE DOUBLE bedrooms. LUXURY shower room. Garage and driveway. Delightful gardens and an OPEN OUTLOOK. 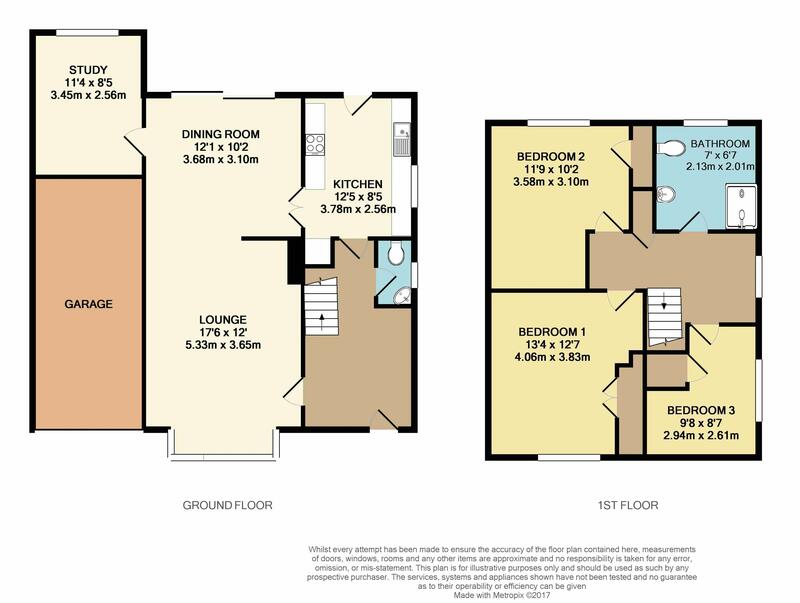 Situated close to local schools shops and transport links. UPVC double glazed front door housed beneath a recessed storm porch opens to. A larger than average entrance hall with stairs rising to the first floor, double glazed window to the side, cloaks cupboard housing the gas meter, cupboard housing the electric meter, radiator, thermostat control. A refitted suite comprising low level WC, corner wash hand basin with mixer, wall light point, radiator, double glazed window to the side, tiled flooring and splash back, cupboard housing Worcester Bosch gas boiler. An extended room with double glazed walk in bay window to the open front aspect, two radiators, TV point, wall light points, feature fireplace with electric fire. Double glazed sliding patio doors to the rear garden, radiator. A refitted kitchen with a range of high gloss base and eye level storage units with integrated appliances that include. Neff built in electric oven and microwave. Neff induction hob with extractor over. Neff dishwasher and washing machine. AEG built in fridge and freezer. Maia work surface areas with inset sink unit. Tiled surrounds and Amtico tiled flooring. UPVC double glazed door to the rear garden and double glazed window to the side. Stair rise to the larger than average first floor landing, access to the loft which is fully insulated and part boarded, door to the airing cupboard, double glazed window to the side aspect. Double glazed window to the side, radiator, built in storage cupboard. A luxury refitted shower room comprising low level WC and wash hand basin housed in vanity unit and surround with illuminated mirror over, walk in double shower with Aqualisa power shower and glass screen, heated towel rail, tiled surrounds and flooring, double glazed window to the rear. Situated alongside with electrically operated roller door, power and lighting. Paved driveway leading to the garage. Laid to lawn with steps leading to the front door, outside lighting. A fully enclosed rear garden with paved area extending to the full width of the property, laid mainly to lawn with established well stocked surrounding borders, timber storage shed, outside tap and security light, gated side access.